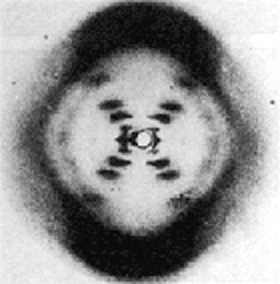 I was reading Watson and Crick’s original article on DNA structure in Nature 171, 737–738 (1953). The accompanying diagram (shown below) has something called the “fibre axis” going through the DNA. This axis isn’t shown in modern models of DNA, so what is it? Short answer: The term fiber axis is not in reference to the DNA model, it comes from the experiments that Watson and Crick used to guess their model. The fiber axis is basically the dimension along the length of the DNA strand. As you can see its got a nice X-shaped pattern. 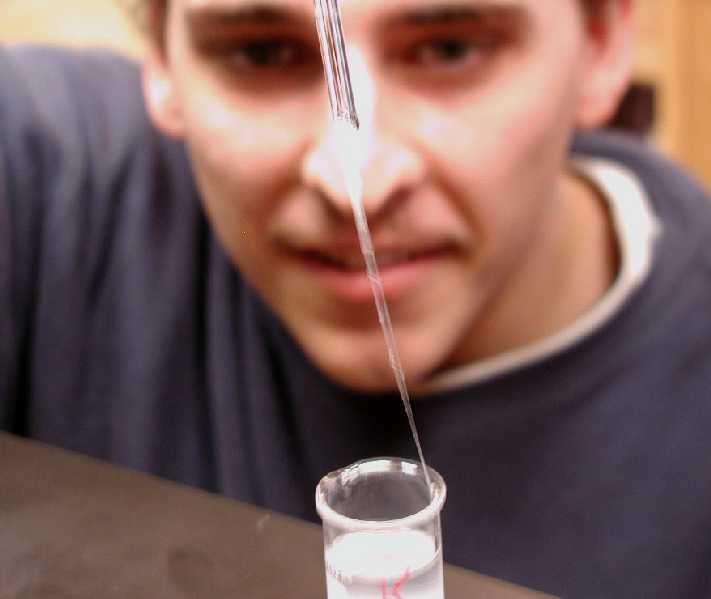 The DNA in the fiber is mostly aligned along the fiber, in the up and down direction. Because this is so, the spacings between the different layers is due to the spacings between the DNA bases and the x-pattern comes from the fact that DNA forms a double helix. Some misc details - you have to use X-rays because their wavelength is about the size of an atomic bond and this is the scale of model Watson and Crick and Franklin and Wilkinson were trying to find. The fiber axis is along the y axis (top to bottom) because the trail of DNA snot hangs down - it will sag if you hold it an angle. Rosalind Franklin was a great experimentalist and she realized that the DNA snot trail dries out over time as the experiment would go on for days. She set up a moist stream of hydrogen gas blowing over the DNA strand during the X-ray experiment and so was the only experimentalist who obtained what we now know to be the true result - double helical DNA. As it dries out, DNA interconverts to the Z-DNA form I believe, which does not have the x-pattern and also confuses things because the result is a smear of the DNA helix converting from one form to another. Francis Crick had actually predicted the X-pattern for helices. The structure actually required these two to come together to get the answer while the American genius Linus Pauling was working hard in California on the structure as well and would have won too if he understood how to keep his snot properly damp. The reference for nearly all of this is Watson's somewhat self-centered but historically accurate book "The Double Helix". After some surprisingly difficult Googling, I can't found a picture of DNA fiber... picture below. You can make some yourself from the protocol listed here and some saliva, soap and other common household items. Not the answer you're looking for? Browse other questions tagged dna structural-biology 3d-structure or ask your own question. Was Raymond Gosling supervised by Rosalind Franklin?